Due to the disadvantages of OData, I will skip this method. Moreover, nearly everything available with OData can be achieved with REST. To get the sample scripts to work you will need to download the following jQuery library: jquery-2.1.1.min.js. Other versions of this library may work but this was the one I used / tested with. Upload this library to your PWA site collection. I created a document library named "Scripts" to hold all scripts including this library. Modify and upload samples of these articles to the same library. To apply a script to a PDP, open the PDP either from PWA Settings – Project Detail Pages. Open PDP for page editing. 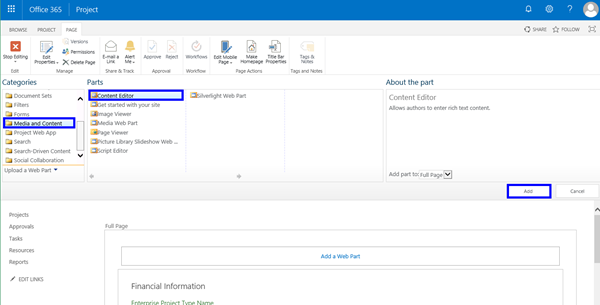 Add a Content Editor web part to your page. 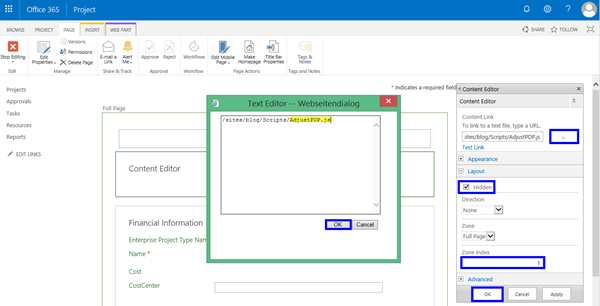 Edit the Content Editor web part. Enter full qualified or relative path to your script. Set Layout to Hidden, users do not want to see this web part. To avoid empty space at the top, set Zone Index to (#WebPartsOnPage – 1) – in this sample two webparts, so the value is 1. Click OK to apply your changes. Now your script will be active on this Project Detail Page. In this article, Enterprise Custom Field CostCenter will be hidden, if there are no cost for the project. Cost is an internal field, so GUID for this field is not known. Moreover, it is a field you cannot edit on an PDP. 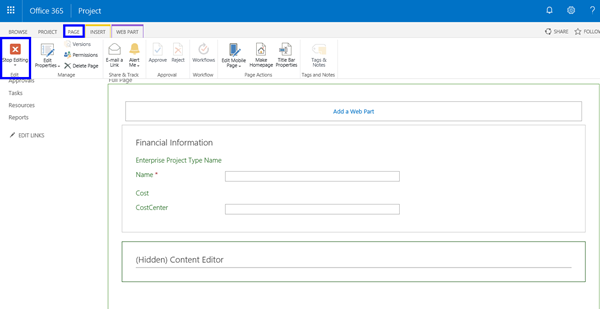 In one of the net articles you will see that it is easier to get a value of an Enterprise Custom fields if project is checked out. The code of this sample will work for a project, no difference if it is checked out or not. Using a field like cost, we need to look for the field name. If you look at the source of the page, you will see that all field information is provided in a table. Now take the information of the page and use it to hide field CostCenter.